Cartilage abnormalities in joints may be more difficult to identify on MRIs when horses are weight-bearing, the findings of a study suggest. Researchers in Belgium and France set out to compare low-field MRIs of joint cartilage in horses between weight-bearing and non-weight-bearing. Low-field MRIs are less powerful than high-field MRIs and do not produce the same image quality. The study team noted that MRI technology – magnetic resonance imaging – is increasingly being used to diagnose foot pain in horses, and recent studies had addressed the possibility of using it to evaluate joint cartilage. They focused on the joints at the hoof, in particular the distal interphalangeal joint. The study centered on the front feet of five non-lame horses who were ultimately euthanized for reasons unrelated to the study. 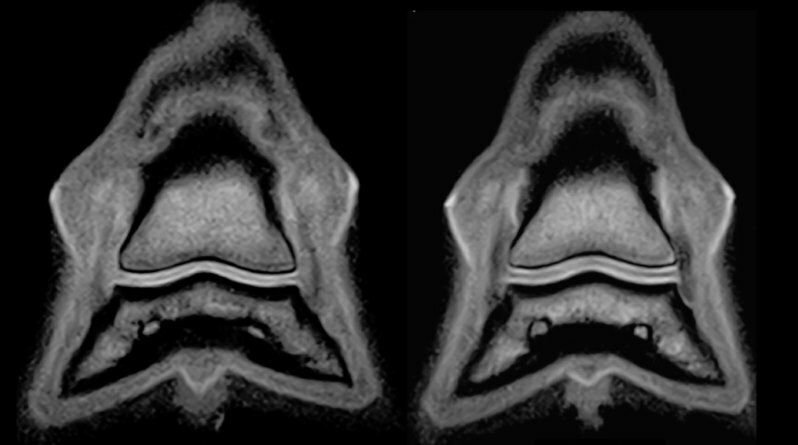 MRI imaging was taken of the joints in the hoof when the horses were standing. Following euthanasia, the imaging was repeated with the leg still vertical, but non-weight-bearing. The thickness and cross-sectional area of the distal interphalangeal joint cartilage and joint space were measured three-dimensionally. The frontal images were randomized and submitted to nine blinded readers with three different experience levels, from equine orthopaedic surgeons to veterinary students, to see whether they could identify which images were taken when weight-bearing and which were not. Blinded readers correctly identified 83% of the images as weight-bearing or non-weight-bearing. The specialists got it right 95% of the time, while the vet students were correct in 75% of cases. The study team from the University of Liège and the National Veterinary School of Alfort found, on analysis, that the weight-bearing limbs had significantly thinner cartilage in the joint than non-weight-bearing limbs. This change was greater in the distal phalanx cartilage than that of the middle phalanx, they reported in the open-access journal PLOS ONE. Frontal tridimensional high-resolution T1-weighted (T1 3D HR) images (on the right) are selected from sagittal T1 3D HR images (on the left) from the same fore foot, obtained respectively during weight-bearing and non-weight-bearing acquisitions. This, they said, suggested that cartilage abnormalities may be more difficult to identify on weight-bearing standing magnetic resonance imaging. Discussing their findings, Laurence Evrard and his colleagues noted that differences in cartilage thickness due to load has been demonstrated in human studies. “It explains the findings of this study,” they said. The cause of the difference in cartilage thickness was most likely related to strain direction and magnitudes varying with joint location and tissue depth, and to differences in the biomechanical properties of the cartilage. They reported that only very small areas of erosion and local surface disorganization, known as fibrillation, were seen in the joints in post mortems. The authors concluded that caution should be exercised when interpreting joint cartilage on weight-bearing limbs and in using cartilage thickness values obtained on non-weight-bearing limbs as a reference for standing MRIs in clinical cases.